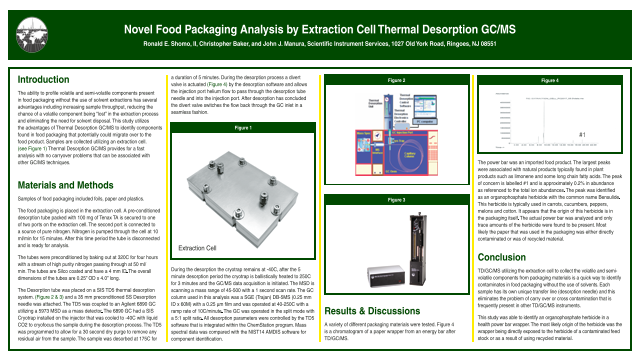 Abstract: TD/GC/MS utilizing the extraction cell to collect the volatile and semivolatile components from packaging materials is a quick way to identify contaminates in food packaging without the use of solvents. Each sample has its own unique transfer line (desorption needle) and this eliminates the problem of carry over or cross contamination that is frequently present in other TD/GC/MS instruments. This study was able to identify an organophosphate herbicide in a health power bar wrapper. The most likely origin of the herbicide was the wrapper being directly exposed to the herbicide of a contaminated feed stock or as a result of using recycled material. Summary: This study utilizes the advantages of Thermal Desorption GC/MS to identify components found in food packaging that potentially could migrate over to the food product. Samples are collected utilizing an extraction cell. Thermal Desorption GC/MS provides for a fast analysis with no carryover problems that can be associated with other GC/MS techniques.